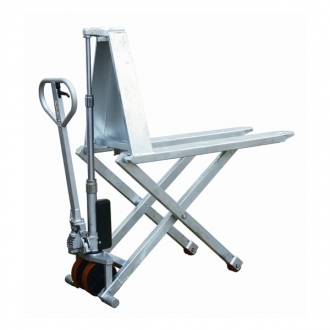 Our Warrior Galvanised High Lift Pallet Truck has a maximum load capacity of up to 1000 kg and a lift height of 800 mm (with the minimum lowered height at 85 mm). Aggressive environments, food production lines, wet areas all benefit from the Tiger Galvanised High Lift Pallet Truck. Where painted machines are forbidden, these trucks fit the bill. No paint to flake, no bare rust patches to contaminate!